 It combines a CO2 inflator, hand pump and tire pressure gauge all-in-one. 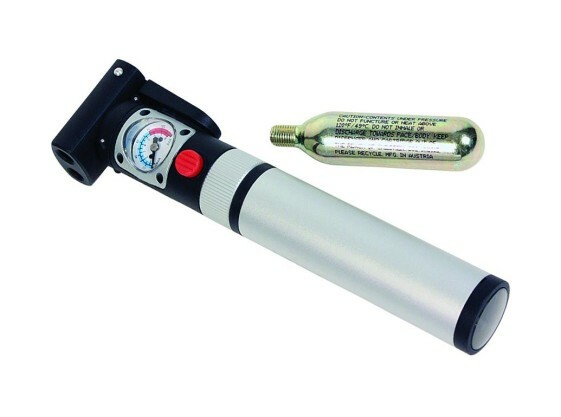 Serfas AP-C1 CO2 Inflator Hand Pump Combo. CO² Inflators are great for airing up your tires quickly after a flat or when you transition from dirt to street. You save weight over an air compressor and you don’t run the risk of draining your battery. The only problem with CO² cartridges is what to do when you run out of them? You never know how many flat tires your group is going to get, so you better be prepared with a back up hand pump. The Serfas AP-C1 CO² Inflator Hand Pump Combo simplifies things by combining a hand pump, tire pressure gauge and CO² Inflator in one device. This device allows you to switch to manual pumping if you happen to run out or forget to bring extra CO² cartridges. Just lock the head of the pump securely on the tire air valve and rotate the body of the pump until the tire pressure gauge is visible. The pressure gauge allows you to monitor your psi while you use the red trigger button to precisely control the air flow. No more detaching and checking air pressure with a separate tire gauge. If your CO² runs out before reaching your desired psi, you can start pumping by hand even with a used cartridge installed. The pump accepts both 12g and 16g threaded CO² cartridges. This light-weight compact device is easy to store in your luggage or tool roll. With the Serfas AP-C1, running out of air cartridges won’t be a problem anymore.